Video clip synopsis – In 1836 Darwin briefly visited Australia. Professor Iain McCalman reflects on Darwin's observation of the impact and triumph of settler society on indigenous peoples. Broadband MP4 iainmccalman01_bb.mp4 (20.0MB), suitable for iPods and computer downloads. Charles Darwin thinks about Indigenous people in Australia was recorded in 2009 as part of the Australian National Maritime Museum special exhibition Charles Darwin — voyages and ideas that shook the world. Charles Darwin thinks about Indigenous people in Australia is on the website Charles Darwin – The Australian Connection produced in 2009 by Ryebuck Media in association with the Australian National Maritime Museum for Screen Australia Digital Learning. The website takes us on an adventure to explore the role Australia played in shaping Charles Darwin’s theories. 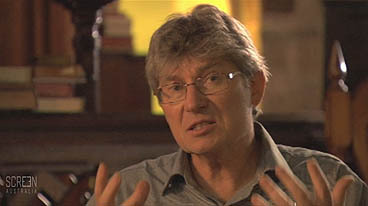 Professor Iain McCalman is a historian at the University of Sydney. During his stay in Sydney he made a trip to Bathurst and the Blue Mountains. His comments on the geology and wild life of the area, and his comments on the possible fate of the Aboriginal people he saw, provide us with strong indications that he was already in the process of developing his famous theory of evolution by means of natural selection, and which he finally published in 1859. Charles Darwin was influenced by many writers, scholars, philosophers, and friends. One of his influences was Thomas Robert Malthus, a late-eighteenth century economist. Malthus wrote “Essay on the Principle of Population” (1798), which Darwin read and was inspired by. The central theme of Malthus’ work was that population growth would always overpower food supply growth, creating perpetual states of hunger, disease, and struggle. The natural, ever-present struggle for survival caught the attention of Darwin, and he extended Malthus’ principle to the evolutionary scheme. Darwin considered that some of the competitors in Malthus’ perpetual struggle would be better equipped to survive. Those that were less able would die out, leaving only those with the more desirable traits. Through his research, Darwin concluded that this ongoing struggle between those more and less fit to survive would produce a never-ending progression of changes in the organism. In its simplest form, this is evolution through natural selection. In your own words explain how Darwin saw Malthus’ ideas as offering an explanation of what he observed in nature. McCalman suggests that Darwin was seeing the same situation with the Aboriginal people. In this case, what was the ‘invasive species’? How was this invasive species a threat to the Aboriginal people? Where, according to Darwin, had this happened before?